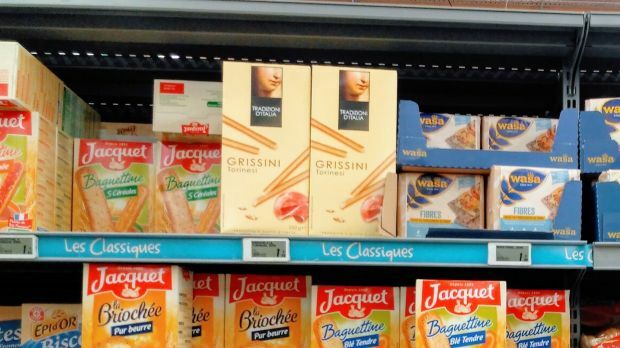 French retailer Les Mousquetaires lists some Creazioni D’Italia Italian specialties in its Intermarché stores. Intermarché has introduced the Italian specialities line ‘Creazioni D’Italia’ in its stores in France, the French newspaper Linéaires writes. The label is sourced by the Italian retailer Conad on behalf of its fellow buying group members at Alidis, as well as for other foreign retailers. The French retailer joins other Alidis members – Coop (CH) and Colruyt – who have sold the label for some time already, according to the paper. The paper also observed that another French retailer, Leclerc, has replaced the ‘Creazioni D’Italia’ label with a very similar line called ’Tradizioni D’Italia’. Conad and Leclerc were formerly buying partners as part of the Coopernic buying group. Following the departure of Conad and other members from Coopernic in 2014, Leclerc no longer enjoyed access to ‘Creazioni D’Italia’ and came up with the ‘Tradizioni D’Italia’ substitute instead the following year. ’Creazioni D’Italia’ is an adaption of Conad’s premium line Sapori & Dintorni, designed for foreign markets. According to Conad’s Director of International Activities, Riccardo Breveglieri, in an interview with Italian newspaper GDO Week back in 2015, the retailer also hopes to sell the range in export markets such as China, as well as in other European countries. Leclerc’s decision to essentially copy Conad’s ‘Creazioni D’Italia’ line should indicate that the French retailer was satisfied with the label’s performance and wanted to replicate it. This should be a recognition that Conad has created a line fully capable of making it abroad. Intermarché, Coop (CH) and Colruyt seem to also agree, since they now all list the label. Still, when browsing through the online stores of all Alidis members, including Edeka, all we found were three ’Creazioni D’Italia’ SKUs at Coop (CH). This would imply that there is still work to be done for Conad in ensuring that all of its partners carry the whole 60 SKU range. Meanwhile, we haven’t received any updates regarding Conad’s ambitions in other foreign markets such as China, USA and the UK for some time. So, the potential is surely there for Conad’s export business, but based on the information available, it’s developing slower than we first expected. Really this goes for the whole phenomenon of Italian private label exports. Italian retailers simply haven’t yet managed to leverage their Italian food tradition heritage to other markets. In fact, international giants Carrefour, Auchan, Schwarz Group and Rewe Group have been responsible for most of the Italian sourced private labels appearing abroad, by leveraging their Italian presence. The fragmented Italian grocery retail market could of course largely explain this. However, retailers including Finiper, Crai and Pam, as well as buying groups such as Sigma, Végé and Selex are becoming increasingly able to operate an export business and all have premium/regional lines that could serve as out-of-the-box export labels. This could happen either through European buying groups (Coop Italia is a Coopernic member, ESD Italia an EMD member, but AMS has no Italian members) to Asian markets like China and USA; or simply any foreign retailer looking for an easy way of differentiating its assortment.